While supplies last, receive a free sample of PERFECT CANVAS skin perfecting serum from REN Skincare. This NEW silicone-free primer comes with skincare benefits thanks to a unique ingredient combination! See below for details on how to request this free SKINCARE sample. 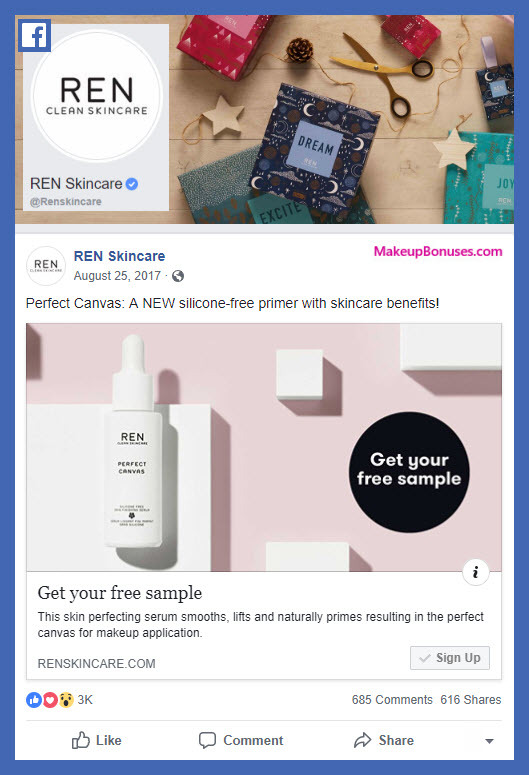 REN Skincare is giving away free samples of PERFECT CANVAS skin perfecting serum! This new product is a silicone-free priming serum for all skin types, designed to sit over moisturizer to plump skin, smooth fine lines and prime skin for make-up. The lightweight formula is packed with natural bio-actives that work to lift and smooth skin, filling out fine lines and wrinkles for a matte finish that holds onto makeup throughout the day. Use by applying 2-3 drops to fingertips after moisturizer and then press over face and neck until fully absorbed (or mix a few drops in with your foundation and apply in one step). Request your free sample and test out these great ingredients in the new formula: Probiotics – strengthens skin’s natural barriers to protect and lock in moisture, Agave Extract – smoothes skin, and Alpha-Glucans – balances the skin’s natural bacteria! No purchase required plus shipping is free! Browse more promotional offers from REN Skincare (the brand) or at REN Skincare (the store). Free Month of Fitness Classes from ClassPass (8 classes) – No Purchase Required! Free Rifle Paper Co 3pc Skincare Set from L’Occitane – No Purchase Required In-Store! « Beauty Offers and Year-End Closeouts including Sitewide Discount at Bloomingdale’s!